The Global Volcanism Program has no activity reports for Level Mountain. The Global Volcanism Program has no Weekly Reports available for Level Mountain. The Global Volcanism Program has no Bulletin Reports available for Level Mountain. Level Mountain is the most voluminous and most persistent eruptive center of the Stikine volcanic belt in NW British Columbia. The massive volcano covers an area of 1,800 km2 SW of Dease Lake and N of Telegraph Creek. An 860 km3 bimodal, Miocene-to-Pliocene stratovolcano with several eruptive centers caps a Miocene basaltic shield. Following extensive glacial dissection and emplacement of late-Pliocene silicic lava domes, lesser activity continued into the Quaternary. More than 20 Tertiary-to-Holocene eruptive centers have been identified in the central portion of Level Mountain and on its flanks. 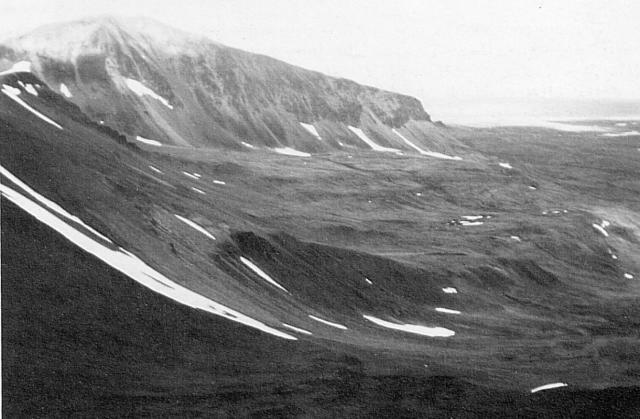 The broad, dissected summit region consists of trachytic and rhyolitic lava domes and was considered to be dotted with several minor basaltic vents of postglacial age (Hamilton and Scafe, 1977), although Edwards and Russell (2000) considered Holocene activity to be uncertain. Edwards B R, 2004. (pers. comm.). Edwards B R, Russell J K, 2000. Distribution, nature, and origin of Neogene-Quaternary magmatism in the northern Cordilleran volcanic province, Canada. Geol Soc Amer Bull, 112: 1280-1295. Gabrielse H, Souther J G, 1962. Dease Lake, British Columbia. Geol Surv Can Map, 21-1962. Hamilton T S, Scarfe C M, 1977. Preliminary report on the petrology of the Level Mountain Volcanic Centre, northwest British Columbia. Geol Surv Can Pap, 77-1A: 429-433. The Global Volcanism Program is not aware of any Holocene eruptions from Level Mountain. If this volcano has had large eruptions (VEI >= 4) prior to 10,000 years ago, information might be found on the Level Mountain page in the LaMEVE (Large Magnitude Explosive Volcanic Eruptions) database, a part of the Volcano Global Risk Identification and Analysis Project (VOGRIPA). There is no Deformation History data available for Level Mountain. There is no Emissions History data available for Level Mountain. Meszah Peak of the Level Mountain volcanic complex is viewed from the east. The dark unit in the center foreground is alkali basalt. Trachytic lava flows and agglomerates form a series of benches at the base of Meszah Peak. The cliff escarpments are formed of pantelleritic welded tuffs capped by thin basaltic lava flows. Level Mountain volcano is the most voluminous and most persistent eruptive center of the Stikine volcanic belt in NW British Columbia, covering an area of 1800 sq km north of Telegraph Creek. Photo by Geological Survey of Canada (courtesy of Cathie Hickson). There are no samples for Level Mountain in the Smithsonian's NMNH Department of Mineral Sciences Rock and Ore collection. IRIS seismic stations/networks Incorporated Research Institutions for Seismology (IRIS) Data Services map showing the location of seismic stations from all available networks (permanent or temporary) within a radius of 0.18° (about 20 km at mid-latitudes) from the given location of Level Mountain. Users can customize a variety of filters and options in the left panel. Note that if there are no stations are known the map will default to show the entire world with a "No data matched request" error notice. Large Eruptions of Level Mountain Information about large Quaternary eruptions (VEI >= 4) is cataloged in the Large Magnitude Explosive Volcanic Eruptions (LaMEVE) database of the Volcano Global Risk Identification and Analysis Project (VOGRIPA).